You're going to want to add this to your kitchen this ~instant~. Raise your hand if you love watching The Food Network but are actually a horrible cook! Well, I'm here with some great news. One of your favorite celebrity chefs, The Pioneer Woman, has a new collaboration that will bring both beauty and ease to your kitchen. Enter: The Pioneer Woman Instant Pot. 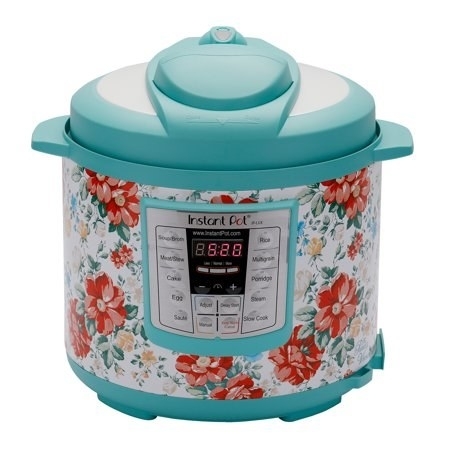 Honestly, this is the most beautiful Instant Pot I have ever seen. And not only will it look amazing in your kitchen, but — as you may have heard — it can basically turn even the worst cook into a master chef. If you haven't heard of the Instant Pot, you may be living under a rock, but that's okay! The Instant Pot has taken kitchens by storm and revolutionized the way that people cook at home. Seriously! This little machine is a pressure cooker, slow cooker, rice cooker, sauté pan, steamer, and warmer in one. And this one has the added Pioneer Woman flair and comes in two brilliant floral designs. 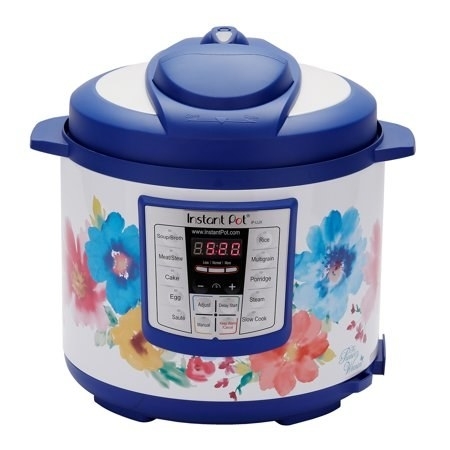 It has all the same features as the original Instant Pot, plus 12 built-in programs (soup/broth, meat/stew, cake, egg, sauté, rice, multigrain, steam, porridge, pressure cook, keep warm, and slow cook), so all you have to do is push a button, and your food will come out just how you want it to! It also has an added three-ply inner-pot stainless steel bottom. The best part is that it speeds up cooking time by two to six times!!! That means you can spend more time bingeing Food Network shows and less time actually cooking — and still have a delicious meal. And if you still doubt me, check out our full review of the Instant Pot. And just like The Pioneer Woman, people LOVE the Instant Pot! You can preorder The Pioneer Woman Instant Pot now (it officially launches Sept. 25) from Walmart for $99 (available in blue and teal floral). Happy cooking! And here are 21 easy Instant Pot recipes to help get you started!